A Christmas Carol is one of the few stories that seems deeply embedded in our collective cultural consciousness. It has been retold many times in many different ways and I'm always game to watch it play it out all over again when a new one comes to my attention. I was VERY excited to hear about A Christmas Carol: A Pop-Up Book for this very reason. And it is absolutely stunning. Please do not assume that because this is a pop-up book it's for children only. Instead, I think this book makes a great way to read A Christmas Carol as a family...there are six pages each with delightful and detailed illustrations. Really they are stunning. Additionally, the entire text of the book is included in small booklets divided up over the pages and included with each. Furthermore, there's a fantastic introduction to the historical significance and cultural impact of the story. 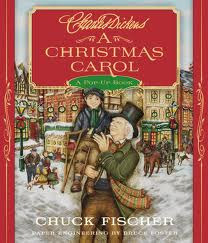 A Christmas Carol: A Pop-up Book is a delightful piece of visual art to enhance your festive celebration.